CASTING ALERT! NATIONWIDE! NOW CASTING YOUNG DANCERS FOR DANCE MOMS! Is Your Kid Destined for Stardom? 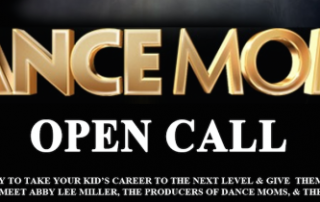 DANCE MOMS - OPEN CALL! If you are ready to take your child's career to the next level and give them the fame they deserve, come meet Abby Lee Miller, the producers of "DANCE MOMS", and the "DANCE MOMS"
CHILD STAR STYLE: Free Tickets to Lifetime Television’s Kids Dance Competition Show! By Editor Tracy Bobbitt|2012-07-29T07:25:00-07:00July 29th, 2012|Categories: CHILD STAR STYLE, Free Tickets to Nick & Disney Show Tapings|Tags: abby of dance moms, Acting, acting agencies, acting agencies in los angeles, acting agency, acting agent, acting agents, acting agents for kids, acting agents in new york, acting and modeling, acting and modeling agencies, acting audition, acting auditions, acting auditions casting calls, acting auditions for disney channel, Acting Auditions for kids, acting auditions in chicago, acting auditions in miami, acting auditions movies, acting auditions nyc, acting calls, acting class, acting classes, acting classes chicago, acting classes for kids, acting classes in atlanta, acting classes in la, acting classes la, acting classes los angeles, acting for children, acting for kids, acting in movies auditions, acting jobs, acting jobs for disney channel, acting jobs for kids, acting los angeles, acting managers and agents, acting movie, acting movies, acting roles for kids, acting tips, acting websites, actors needed, agencies for acting, agent for acting, agents for acting, audition for movie, audition movie, audition to be an actress, Auditions, auditions for commercials, auditions for disney channel, auditions for disney channel 2011, auditions for kid movies, auditions for kids, auditions for movies, auditions for nickelodeon, baby commercial auditions, baby modeling agencies, become a disney channel star, becoming an actor, best acting classes, best acting in a movie, best kid actors, best kids actors, casting agents, Casting Calls, casting calls for kids, child acting, child acting agencies, child acting agents, CHILD ACTORS, child auditions, child modeling, child star agents, child star auditions, child stars, child talent agencies, children acting auditions, children actors, children modeling agencies, commercial auditions, commercial auditions for kids, commercial casting calls, Dance Moms, dancers, disney channel acting auditions, disney channel auditions, disney channel auditions for kids, disney child actors then and now, disney movie auditions, do child actors go to school, film auditions, free television tapings, good agents for acting, hollywood casting calls, Hollywood Mom Blog, hollywood movie auditions, how to get children into acting, i wanna be an actor, i want to be famous, kid acting auditions, kid auditions, kid auditions 2012, kid auditions for movies, kid modeling, kid modeling agencies, kids acting agents, kids acting auditions, kids auditions for movies, kids modeling agencies, la auditions, lifetime television, local auditions, los angeles acting, Majestic Talent, modeling agencies, modeling agencies for kids, modeling and acting, modeling and acting agencies, modeling and acting agencies in los angeles, modeling auditions, modeling for kids, modeling jobs, modeling jobs for kids, movie acting, movie acting auditions, movie auditions, movie auditions 2011, movie auditions for kids, movie auditions for teenagers, movie casting calls, movie extras, movies acting, movies auditions for kids, old child actors, online acting auditions, online acting classes, Open Casting Calls, play auditions, studio audience member, talent agencies, talent agencies for kids, talent agency, talent agent, top acting agencies, top acting classes, upcoming movie auditions, young actors then and now, young children actors|Comments Off on CHILD STAR STYLE: Free Tickets to Lifetime Television’s Kids Dance Competition Show! REVIEW & GIVEAWAY: PURPLE PIXIES Brings a Rainbow of Color to the Red Carpet! CASTING CALL Atlanta: @DropDeadDiva Casting Skilled Child Dancers & Their Hollywood Moms! By Editor Tracy Bobbitt|2012-05-28T01:54:25-07:00May 28th, 2012|Categories: Auditions, Casting Calls, THE BUZZ|Tags: Abby Lee Miller, Acting, acting agencies, acting agencies in los angeles, acting agency, acting agent, acting agents, acting agents for kids, acting agents in new york, acting and modeling, acting and modeling agencies, acting audition, acting auditions, acting auditions casting calls, acting auditions for disney channel, Acting Auditions for kids, acting auditions in chicago, acting auditions in miami, acting auditions movies, acting auditions nyc, acting calls, acting class, acting classes, acting classes chicago, acting classes for kids, acting classes in atlanta, acting classes in la, acting classes la, acting classes los angeles, acting for children, acting for kids, acting in movies auditions, acting jobs, acting jobs for disney channel, acting jobs for kids, acting los angeles, acting managers and agents, acting movie, acting movies, acting roles for kids, acting tips, acting websites, actors needed, agencies for acting, agent for acting, agents for acting, audition for movie, audition movie, audition to be an actress, Auditions, auditions for commercials, auditions for disney channel, auditions for disney channel 2011, auditions for kid movies, auditions for kids, auditions for movies, auditions for nickelodeon, baby commercial auditions, baby modeling agencies, become a disney channel star, becoming an actor, best acting classes, best acting in a movie, best kid actors, best kids actors, Bill Marinella Casting, Brandy Norwood, Brooke Elliott, casting agents, Casting Calls, casting calls for kids, child acting, child acting agencies, child acting agents, child auditions, child dancers wanted, child modeling, child star agents, child star auditions, child talent agencies, children acting auditions, children actors, children modeling agencies, collective uth, commercial auditions, commercial auditions for kids, commercial casting calls, Dance Moms, dance moms casting call, disney channel acting auditions, disney channel auditions, disney channel auditions for kids, disney child actors then and now, disney movie auditions, do child actors go to school, Drop Dead Diva, Emily Rutherford and Jake T. Austin, Executive Producer Josh Berman, film auditions, good agents for acting, hollywood casting calls, Hollywood Moms, hollywood movie auditions, how to get children into acting, i wanna be an actor, i want to be famous, Jackson Hurst, John Ratzenberger, Kate Levering, kid acting auditions, kid auditions, kid auditions 2012, kid auditions for movies, kid modeling, kid modeling agencies, kids acting agents, kids acting auditions, kids auditions for movies, Kids casting call, kids modeling agencies, Kim Kardashian, la auditions, local auditions, los angeles acting, Margaret Cho, Megyn Price, modeling agencies, modeling agencies for kids, modeling and acting, modeling and acting agencies, modeling and acting agencies in los angeles, modeling auditions, modeling for kids, modeling jobs, modeling jobs for kids, movie acting, movie acting auditions, movie auditions, movie auditions 2011, movie auditions for kids, movie auditions for teenagers, movie casting calls, movie extras, movies acting, movies auditions for kids, old child actors, online acting auditions, online acting classes, Open Casting Calls, Patty Duke, play auditions, Reality TV on Series Tv, Serena Williams, show within a show, talent agencies, talent agencies for kids, talent agency, talent agent, top acting agencies, top acting classes, upcoming movie auditions, Valerie Harper, young actors then and now, young children actors|Comments Off on CASTING CALL Atlanta: @DropDeadDiva Casting Skilled Child Dancers & Their Hollywood Moms!